I love just about any meal that comes in a bowl. I don’t’ really know when this obsession developed. My husband thinks I’m a bit strange (well, sometimes a lot strange) that my palate for a variety of colors, texture, and flavors all cohabitating together and teasing my taste buds simultaneously is very intriguing yet comforting to me. Not that he minds them at all. He just thinks I’m a bit over the top with my infatuation. See, this meal preference has been growing for a couple of years. I always thought that I was just lazy and didn’t want to put all the different dishes into separate bowls that I’d later have to clean up. And I’m always looking for a way to save time and energy (especially in the evening). Aren’t most of us? So, I would eat my bowl meals with an underlying taste of laziness … self-inflicted, of course. But no! Recently I put this premise under the proverbial microscope. I’ve discovered that I’m not lazy. I really enjoy the way all the varied ingredients excite me all at once. Crunch mixed with tender. Earthy subdued with mild and familiar. Buttery cut with a hint of lime juice that wakes up the senses for just a moment. Yes, this is what I am obsessing about with “bowl food”. Lazy? No! Intriguing? Absolutely! The gratifying aspect of combining all the ingredients into a meal that allows each bite to be every bite is that each bowl meal recipe can be spontaneous because there really aren’t any rules to creating them. They are personalized per your preferences – and what you have in the fridge and cupboard, of course. 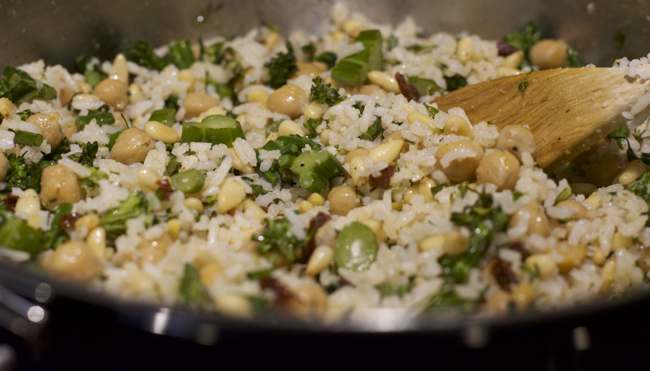 This time I created a medley of vegan ingredients rich with chickpeas (garbanzo beans), broccolini (similar to broccoli only cuter), sundried tomatoes, toasted pine nuts, and Basmati rice. 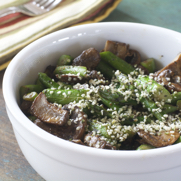 I like to create a combination of four main focal ingredients: beans and/or legumes (for fiber and iron), vegetables (vitamins and antioxidants), rice or a gluten-free grain such as sorghum (a healthy carb/starch), and nuts and/or seeds (protein and healthy fats). The proper oils also fulfill the healthy fat category, such as avocado, olive, hemp seed, and coconut oil. Sometimes I’ll just really go wild (yeah, right) and add some fruit like apples, cranberries, raisins, or dates. Oh, now we’re talking! Virtually any combination of flavors is possible when you allow yourself to play in the produce section of your local grocery store. Step outside the carrots and peas “box” and see what you might be exciting to add to your grocery bag. By mixing up the four focal points I mentioned above, you know you can have a nutritious, well-balanced vegan meal ready in short order. If you make your rice or gluten-free grain ahead of time (which usually takes a little longer to cook than the other ingredients), you can portion it out into meal-size quantities and freeze it for quick retrieval. So the next time you go grocery shopping, take a moment to look at the produce department a bit differently and see what colors and textures grab your attention. If you or your family members are not big risk takers, you can start modestly and build up the variety slowly, gradually increasing your palate and your choices. Just keep this in mind: the more colorful, the more nutritious. And, the more exciting the meal will look, which is important because we eat with our eyes first. And just to state for the record one last time, “I’m not lazy”! Heehee. Prepare rice and water according to package directions. Set aside until ready to use as directed below. 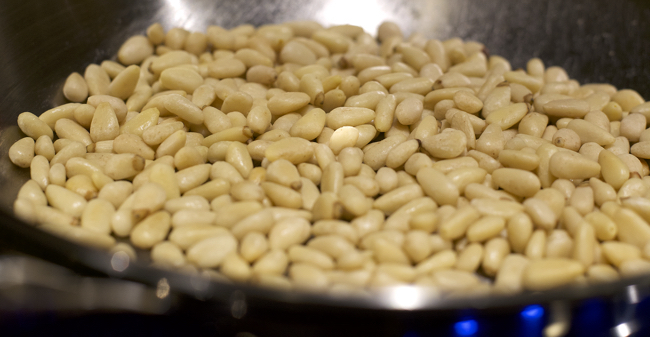 In a small sauté pan, add pine nuts and begin toasting over low heat. Every couple of minutes, toss nuts to enable them to become golden on both sides. They will burn easily if heat is too high, so watch closely. Set aside to cool. In a large skillet, add avocado oil. Warm over medium-low heat. Add broccolini and stir to coat with oil. Increase heat to medium and cook until the stems become crisp-tender and can be pierced with a fork but are still firm. Squeeze lime juice over the broccolini for flavor brightness. 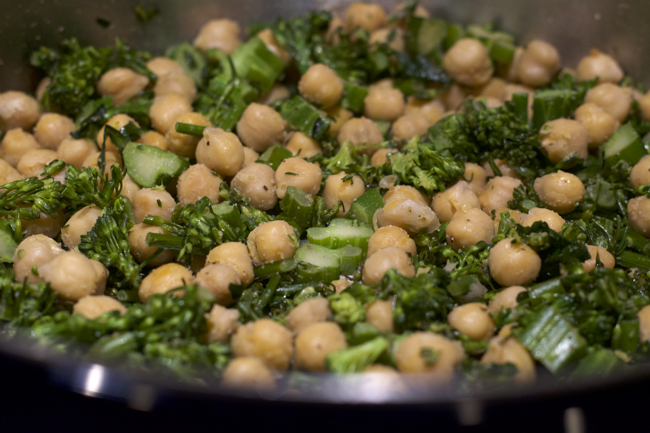 Add the garbanzo beans, sundried tomatoes, herbs, onion powder, and garlic powder. Add a pinch of salt and pepper. Mix well. Taste and adjust seasonings as desired. Add toasted pine nuts to the bean/veggie mixture. Stir. Begin stirring the cooked rice into the mixture, about 1 cup at a time, until reaching the desired ratio of rice to vegetable mixture preferred. Drizzle additional oil over the rice medley to achieve silkiness and a pleasing smoothness in each bite. Taste and adjust seasoning with salt, pepper, onion and garlic powders, as needed. 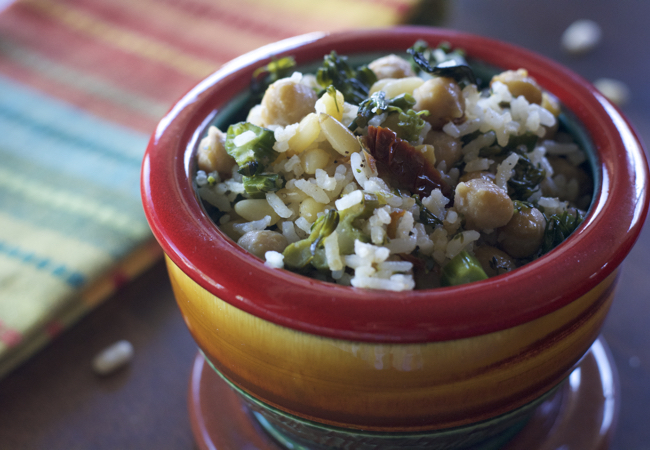 Spoon Vegan Chickpea Broccolini Rice into serving bowls and enjoy hot. Squeeze just a hint of fresh lime juice over each serving. Store completely cooled leftovers in an airtight container in the refrigerator for up to 5 days. Enjoy this as a meatless main course. 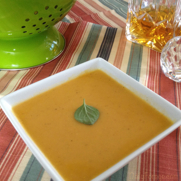 Serve a smaller portion and accompany with a bowl of Homemade Creamy Tomato Soup.